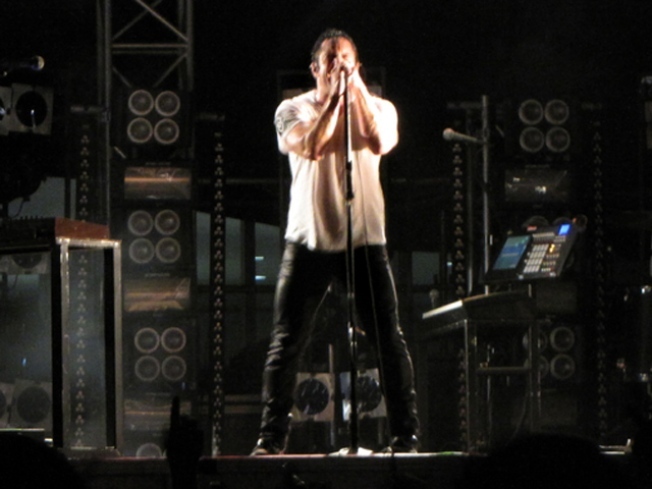 Trent Reznor and NIN play Terminal 5 on their farewell tour. NINE PLUS ONE: Are we happy to hear Nine Inch Nails make the walls of Terminal 5 throb tonight – especially since this is reportedly their farewell tour? Yes. But we’re actually almost more excited about the fact that much-buzzed-about Mew will be opening for them – especially since we’ve been spinning their album “No More Stories are Told Today” (which dropped yesterday) on heavy ro. 7:30PM. “HEAD” TRIP: Argentine director Lucrecia Martel is turning into one of the most discussed filmmakers on the art-house scene today: Her feature “The Headless Woman” – about a middle-class housewife who may have been behind the wheel of a hit-and-run -- milks bourgeois entitlement for all its heartwrenching, nauseating detail. See it at Film Forum; various times. PARTY LINES: The folks at the East Village’s Hearth – who already get our mad love for their pig roasts – are holding a presidential soiree that deserves your vote: Swing by for POTUS-themed cocktails like the Richard M. Nixon Mai Tai (which involves rum and orgeat) and generous bar bites from the kitchen (sweetbreads!) at this party designed to mirror Obama’s weekly Wednesday bipartisan cocktail nights. 6-10PM (every Wednesday).